Technologies like Illumina's sequencing machine are radically cutting the cost of mapping out the human genome. Mark Costa has a higher-than-average risk of stomach cancer, a lower-than-average risk for Alzheimer's, and he metabolizes caffeine very slowly. "Now I don't wonder why I can't sleep if I have coffee at 2 p.m.," he says. Afternoon jitters, though, were not the reason Costa, a primary care physician, decided to have his DNA sequenced last year. He wanted to find out if he was predisposed to certain illnesses and see if the test he took -- priced at just $99 -- might be useful for his patients. Costa, who owns Enhanced Medical Care in Newton, Mass., had his DNA sequenced by 23andMe. The Mountain View, Calif., startup has been a pioneer in low-cost genetic testing aimed at consumers, with a test that currently analyzes around 1 million locations on each client's genome and generates a report on 248 health conditions and traits. Entrepreneurs and scientists are pursuing an even more dramatic medical breakthrough: The ability to sequence an entire human genome for around that same $100 price tag. That goal remains a few years away, but the obstacles are falling fast. That's not cheap, but it's an enormous plunge from where the price tag stood just a few years ago. When one of the first individual genomes was sequenced in 2007 -- that of James Watson, co-discoverer of DNA's double-helix shape -- it cost around $1 million. "The cost-per-bit of biologic information is coming down faster than Moore's Law," says G. Steven Burrill, the founder of Burrill & Company, a San Francisco financial services firm focused on the life sciences industry. A data set compiled by the National Institutes of Health's genome research lab bears out that comparison: Since 2007, the cost of genome sequencing has been in free-fall, dropping by as much as 90% several years in a row. Dozens of startups are trying to carve off their chunk of a genetic testing market that UnitedHealthcare estimates could reach $25 billion annually by 2021. Innovations like "ion torrent" sequencing, created by a startup acquired in 2010 by Life Technologies (which was itself just purchased by Thermo Fisher Scientific (TMO)), aim to slash costs. Sequencing has traditionally been done optically, by flooding DNA snippets with chemicals called reagents that contain one of DNA's four bases. Every base has only one match; when a base finds a match, a light flashes. The sequencer sees it and records the base. With the Ion Proton System -- a $100,000 machine that can sit on top of a table -- it's not light that's being recorded, but changes in pH balance. The DNA snippets being sequenced are attached to tiny beads sitting in as many as a billion tiny wells on a custom-designed semiconductor chip. The chip is flooded with DNA nucleotides, and when a base snaps into place, a hydrogen ion is released and recorded. The machine sequenced Gordon Moore's genome in 2011 for $100,000, says Life Technologies CEO Jonathan Rothberg. The results were published in the journal Nature in July 2011. Right now the company can sequence the exome -- the 1 percent of the genome we know how to interpret -- for $500. "In three months, we'll be able to do one entire human genome for $1,000," predicts Rothberg, whose first company, 454 Life Sciences, was the one that sequenced James Watson's genome. Eric Topol, a professor of genomics and director of the Scripps Translational Science Institute in San Diego, says chip sequencing -- without expensive reagents -- has the potential to be "remarkably cheaper" than traditional optical sequencing. 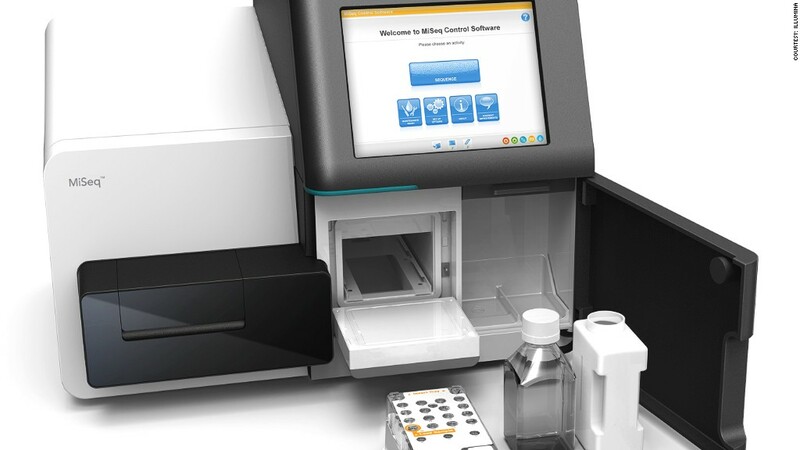 The industry standard today for sequencing and "genotyping," which looks only at a select number of DNA variations, are arrays and sequencers from a company called Illumina (ILMN). Most labs using the San Diego firm's equipment can sequence an entire genome for $3,000 to $4,000. "Everyone likes lopping zeros off the price of the genome, but it's really not at $1,000 yet -- although it's starting to inch up on that," says company president and CEO Jay Flatley. Illumina's arrays are quickly becoming cheaper and denser. Other advances are also driving down prices. Topol cites innovations like nanopore sequencing, which passes DNA through a protein nanopore: "That's a very efficient way of getting millions and millions of bases read." That approach still has "significant problems with accuracy," he noted. Another startup trying to slash costs is InVitae, a sequencing company in San Francisco that targets rare, inherited diseases. Individually, these diseases -- like cystic fibrosis, Tay-Sachs, Canavan disease and Lynch syndrome -- are rare, but in the aggregate millions of people have them or carry the gene for them. InVitae tests for 264 genetic conditions and charges $1,500. By 2014, it expects to test 1,000 inherited conditions for $1,000. "We would like to drive the cost down so anyone can use this," says CEO Randy Scott. "Eventually, you would screen someone at birth to see if they have any of these known genetic conditions or are a carrier." But bringing testing to the masses requires more than just lower prices for the sequencing itself. Doctors and consumers need to understand the information they are getting. "You have to teach physicians how to use these tools and integrate them," Scott says. Steven Burrill had his genome sequenced--along with his wife's and son's--and keeps it on his iPad. It's so detailed that he can drill down to the chromosomal base pairs and pull them apart -- but he doesn't know the full significance of what he is seeing. "We have information available today beyond our ability to absorb it," he says.